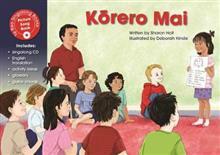 The CLNZ Educational Publishing awards 2015 -- Te Reo Singalong books won the Best Resource in Te Reo Maori. Maria Gill, children's book reviewer: I recommend schools buy one for each classroom and or get class-sets. Many teachers want to teach more Maori but don't feel confident - this will help them do it in a fun way.